Several student pharmacists from Duquesne University School of Pharmacy were honored at the Student Organization Leadership and Service Awards, which took place in the Duquesne University Ballroom on April 20. The awards, presented by the Center for Student Involvement and Office of Greek Life, recognize the contributions that student leaders, student organizations and advisors make to the University community. Lisa Maooni received the Emerging Leader of the Year Award. 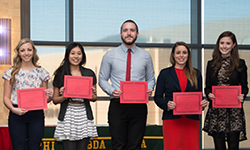 Student Leader of the Year Awards were presented to Lyndsey Garde and Josianne Kadjo. The following student pharmacists were honored as SPIRIT Emerging Leaders: Caitlin Burley, Kristen Cirbus, Victoria Dadebo, Sean Eberly, Molly Graveno, Erin Hayden, Irene Jankowski, Kathryn Kerr, Amanda Lessig, Jacquelyn Madler, James McCracken, Lori Melikian, Lisa Mutooni, and Choniece Phillips.